The Boys Town Alumni Ambassador Program partners directly with Boys Town to tell the compelling story of how and why Boys Town is so successful. It was created as a way for alumni to give back, in a meaningful way, for the gift we were given by Boys Town--a chance in life! 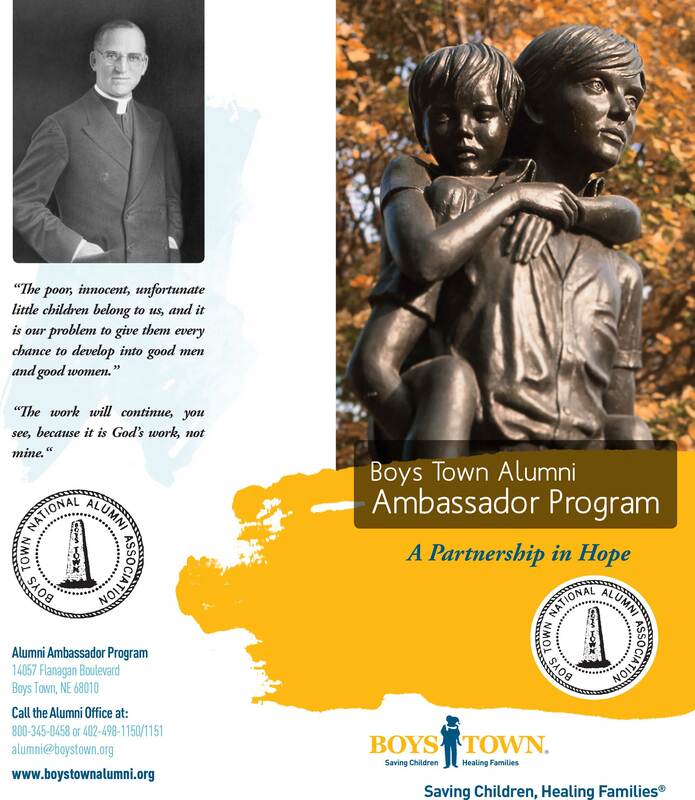 All you need to do is contact the Alumni Office at Boys Town and tell them you want to be an ambassador. If you belong to a civic or neighborhood association looking for a program presentation; volunteer to tell your story. 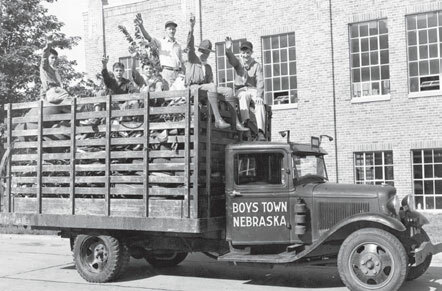 We will send you materials and provide you the information to make a compelling presentation about the history of Boys Town and about the programs of today. The best story you can tell is yours!! You are living proof that Boys Town has long-term and positive impacts on individuals and communities. The Alumni Ambassador Program marks a milestone in the relationship of Boys Town and our wonderful alumni. Servant of God Father Flanagan’s example of relying on the alumni to be Ambassadors for the good work of the Home has proven, through the years, to be of inestimable value. Servant of God Father Flanagan needed his alumni to let everyone know about his work so he could take care of his boys. His alumni wanted to give back in the most meaningful way possible, and that was to let everyone know they were from Boys Town and to give their support when Servant of God Father Flanagan needed it. He created a partnership with his alumni to help in the mission of Boys Town that has lasted and grown through the years. Today is no different. Children may have different needs and challenges and the program of care has evolved, out of necessity, in both scope and sophistication---but Boys Town continues to save children and heal families. It does this with the financial and moral support of the generous citizens of our nation. I can think of no better way to let America know about what we are doing for children than to have thousands of Alumni Ambassadors telling, firsthand, of the tremendous success of their lives and the successes that happen every day at Boys Town. Your Boys Town National Alumni Association Board of Directors, by unanimous vote, endorsed the Alumni Ambassador Program as an important way to partner with Boys Town. I encourage you to consider becoming an Alumni Ambassador. Together, we will help more kids and make America more aware of the great work that goes on at Boys Town every day of the year. Thank you for becoming a Boys Town Alumni Ambassador. God Bless you and your families. Who is an Alumni Ambassador? Click here to fill out an online form and submit to the Alumni Office.